Friday night dining was an improptu and hopeful event.I was out with a friend for a quick drink at the Big Chill bar and on the way there passed Quay Head House. I knew about the Cloak and Dinner restaurant (open 27 to 30 January) from reading reviews by Bristol Culture and EatBigBristol who ate there the previous evening. I wanted to see Belleruche play at the Big Chill bar at 11pm but it was 7.30pm and we guessed there would be plenty of time to go, wait, eat (hopefully) and then come back. We knocked on the door and were let in (bolts sliding open on the inside) only to be told that they were fully booked but that we were welcome to wait in the lounge until a table became available. The people there were friendly and we were given a gin and tonic and the advice to keep an eye on the website. The aim was to find beautiful buildings and use them as restaurants. The room had low lighting and plates with pistacchios and cashews were littered around on the tables. 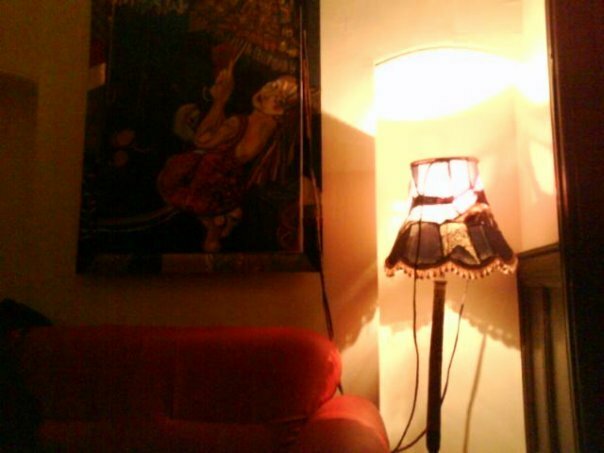 A lamp in the corner had a colourful shade in tones of grey black and red. There was artwork on the walls and while we sat a new painting was placed behind me with the comment ‘I hope it doesn’t fall on you’. Luckily it didn’t. As lovely as the setting was, the temperature was cold and I didn’t take off my jumper and was tempted to keep my jacket on as well. The smoking policy was enjoyed by my companion and the young female students sitting across from us. They kept their jackets on. The dress of the customers and the staff was varied. There was a charming, gleeful, almost bohemian tone to those involved with the restaurant, while others looked ready for a night out. I was in work clothes, friend in jeans and everyone seemed to fit in among the top hats and the fake moustaches. The staff member greeting people had a suit on, stockings and one trouser leg rolled up to the knee. The music downstairs was arranged by a guy with a laptop and iTunes. Same upstairs. Three gin and tonics went by and two hours later we were tired of being cold and hungry and decided to leave. We left ten pounds for our drinks but the man with the reservation book asked us to stay for just a little longer. People are starting to leave now and there should be some space soon. We were told we could share a table with some of their friends and we agreed and sat back down. He passed back the ten pounds and said donate it at the end if you want and smiled. About 20 people soon left the restaurant so there was a table available and we didn’t have to share. The room upstairs was friendly and brighter than the lounge while the atmosphere was pleasant and comforting. People didn’t look up and the view of the city was grimy through the windows but we relaxed. Behind us was a table of older people and we marvelled to the waitress that the clientele was so varied. She agreed and then told us the table behind us were actually the chef’s parents. Still. Billie Holiday sang that her baby don’t care for high rise places and our order was explained and taken and the jazzy, mellow mood was set. We ordered the Borscht soup and then starters of filo pastry with some topping which I can’t remember. 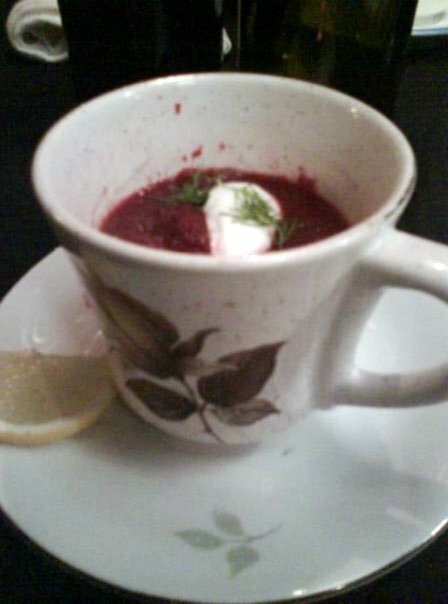 The soup was firm and textured with cabbage and beetroot, topped with sour cream and dill. It was served in a tea cup and there was only one spoon on the table but my friend used his fork and it was just as effective. The soup was hearty and well-seasoned. Not too sour and not too sweet. The red wine in the unmarked bottle was light and slightly dry, a Chianti perhaps. The starters ran out so we skipped that course. We ordered one each of the mains which were venison with salt pork slow cooked and bean casserole. The intention was to share but I was only allowed one bite of venison before he announced that I was having no more, he loved it. The bean casserole was just as good, if not better, and there was a dumpling of some sort which the waiter said was flavoured with thyme. Very nice. The bean stew sat on a cabbage leaf on top of a parsnip mash. The portions were moderate in size which suited perfectly as we also ordered dessert to end the meal. The waiter collected our dishes and while Elvis crooned that he didn’t want no other love, the girls from two tables away grabbed our cutlery because their table had none. We all laughed and no one questioned the re-use of the forks and knives, well not out loud. Dessert was a choice between vegan banana cheesecake and a Canterbury apple tart. Both were light and tasty. The vegan cheesecake was intriguing and had dark chocolate melted with whole hazelnuts on top of grated banana. Tables filled up around us but there were still some empty ones at ten o’clock. Two men with shaved heads and black leather jackets sat down in the corner and one said to the other ‘this is nice isn’t it?’. The food was very good and the setting and the ambience of the place was even better. We talked to four or five of the staff volunteering there and they were all enthusiastic, open and friendly. 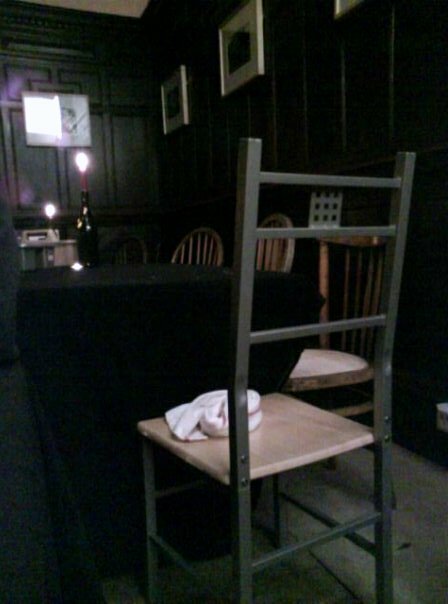 We were told that while the restaurant was a squat, all the appropriate regulations were followed and it was legal. Something was mentioned about the bills being paid and procedures being followed. The staff were happy to be there and it showed. The squatting scene does bring a welcoming atmosphere but it doesn’t do much for heat. The hot water taps didn’t work in the bathroom downstairs where the facilities are shared by men and women. A broken toilet door has a sign that politely suggests people knock before they enter and the hall is lit with candles and overhead lighting. We left in a great mood and felt as if we’d shared our experience with the people working there and not just been served. We didn’t get to see Belleruche around the corner because the queue was long and the night was cold. I heard the band play a little when they did their sound check however and they sounded great – the vocals were huskier and the guitar was lighter than on the cd. My evening started with Kathrin deBoer singing ‘I fell for you’ and ‘some things just ain’t meant to be there’. I guess that’s how it ended as well. The restaurant is there for one more night (tonight) and then it won’t be there. The beautiful building will be left empty once more but I’ll keep a look out for the restaurant which will surely pop-up somewhere around Bristol again. This entry was posted in Bristol and tagged Belleruche, Big Chill, Bristol, cloak and dinner, Food, restaurants. Bookmark the permalink.